The admission control mechanism inspired in the framework of proportional differentiated services has been investigated. The mechanism provides a predictable and controllable network service for real-time traffic in terms of blocking probability. Implementation of proportional differentiated admission control is a complicated computational problem. Previously, asymptotic assumptions have been used to simplify the problem, but it is unpractical for real-world applications. We improve previous solutions of the problem and offer an efficient nonasymptotic method for implementation of proportional differentiated admission control. Efficient implementation of admission control mechanisms is a key point for next-generation wireless network development. Actually, over the last few years an interrelation between pricing and admission control in QoS-enabled networks has been intensively investigated. Call admission control can be utilized to derive optimal pricing for multiple service classes in wireless cellular networks . Admission control policy inspired in the framework of proportional differentiated services  has been investigated in . The proportional differentiated admission control (PDAC) provides a predictable and controllable network service for real-time traffic in terms of blocking probability. To define the mentioned service, proportional differentiated service equality has been considered and the PDAC problem has been formulated. The PDAC solution is defined by the inverse Erlang loss function. It requires complicated calculations. To reduce the complexity of the problem, an asymptotic approximation of the Erlang B formula  has been applied. However, even in this case, the simplified PDAC problem remains unsolved. In this paper, we improve the previous results in  and withdraw the asymptotic assumptions of the used approximation. It means that for the desired accuracy of the approximate formula an offered load has to exceed a certain threshold. The concrete value of the threshold has been derived. Moreover, an explicit solution for the considered problem has been provided. Thus, we propose a method for practical implementation of the PDAC mechanism. The rest of the paper is organized as follows. In the next section, we give the problem statement. In Section 3, we first present a nonasymptotic approximation of the Erlang B formula. We then use it for a proportional differentiated admission control implementation and consider some alternative problem statements for an admission control policy. In Section 4, we present the results of numerous experiments with the proposed method. Section 5 is a brief conclusion. : is the Erlang loss function, that is, under the assumptions of exponential arrivals and general session holding times , it is the blocking probability for traffic of class . In practice, the limited regime (7) is not appropriate. But the simplification (8) can be used without the conditions (7). Actually, the approximation (6) can be applied without the condition (4). We prove it below. We assert that for the desired accuracy of the approximation (6) an offered load has to exceed a certain threshold. The concrete value of the threshold is given by the following theorem. From the inequality (20), we obtainthe condition (9). Note that the approximate formula (6) can provide the required accuracy in the case of . Actually, if , then the required accuracy is reached for . Thus, the condition (9) is sufficient but not necessary. It guarantees the desired accuracy of the approximation for any small and . Thus, the formulas (23)–(25) provide the implementation of proportional differentiated admission control. It is clear that for some values , we can obtain in (24) or in (23). Therefore, the problem is unsolvable and PDAC implementation is impossible for the given parameters. It follows from the theorem that the approximation (6) is applicable even for and any small if . In spite of this fact, the solution above cannot be useful for small values of the ratio . In this case, the loss function is sensitive to fractional part dropping under calculation . For example, if kb/s, , and we obtain kb/s, then the approximate value of the blocking probability is about 0.004. But and . Thus, the offered approximate formula is useful if the ratio is relatively large. Let be the number of channel assigned for class traffic, . Each class is characterized by a worst-case loss guarantee [7, 8]. Thus, the optimization problem (35) is reduced to the problem (1). Let us illustrate the approximation quality. 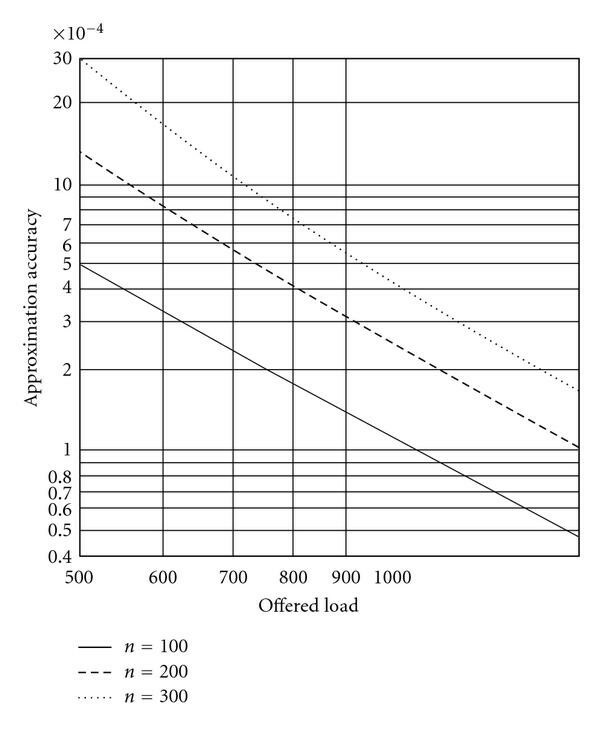 The difference is plotted as a function of offered load in Figure 1. 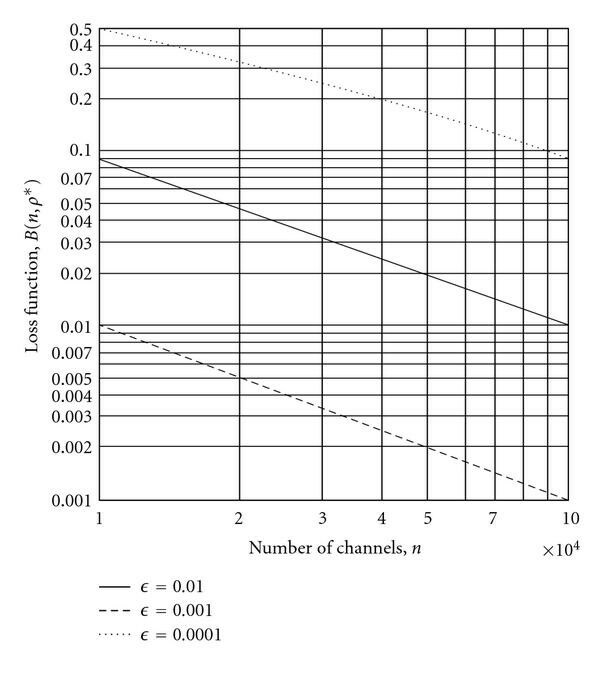 If the number of channel is relatively small then high accuracy of approximation is reached for heavy offered load. Let us remark that heavy offered load corresponds to high blocking probability. Generally, this situation is abnormal for general communication systems, but the blocking probability decreases if the number of channels increased relative accuracy . Let us designate . If the approximation (2) is admissible for then it is also admissible for any . In Figure 2, the behavior of losses function according to different is shown. Thus, the provided approximation is attractive for a performance measure of queuing systems with a large number of devices. Approximation quality as a function of the offered load. The behavior of losses function according to different values of . Next, we consider a numerical example to evaluate the quality of a PDAC implementation based on the proposed method. Assume that Mb/s, kb/s, . In average, there are 1000 channels per traffic class. Following the theorem above, we conclude that the blocking probability can be replaced by the approximation (6) with accuracy about 0.01. Using (23)–(25), find a solution of the simplified PDAC problem and calculate the blocking probability for the obtained values. The results are shown in the Table 1. If an obtained accuracy is not enough, then the formulas (23)–(25) provide efficient first approximation for numerical methods. In this paper, a simple nonasymptotic approximation for the Erlang B formula is considered. We find the sufficient condition when the approximation is relevant. The proposed result allows rejecting the previously used limited regime and considers the proportional differentiated admission control under finite network resources. Following this way, we get explicit formulas for PDAC problem. The proposed formulas deliver high-performance computing of network resources assignment under PDAC requirements. Thus, an efficient method for proportional differentiated admission control implementation has been provided. This research was supported in part by MKE and MEST, Korean government, under ITRC NIPA-2010-(C1090-1021-0008), FTDP(2010-0020727), and PRCP(2010-0020210) through NRF, respectively. A preliminary version of this paper was presented at MACOM 2010, Spain (Barcelona) . The present version includes additional mathematical and numerical results.